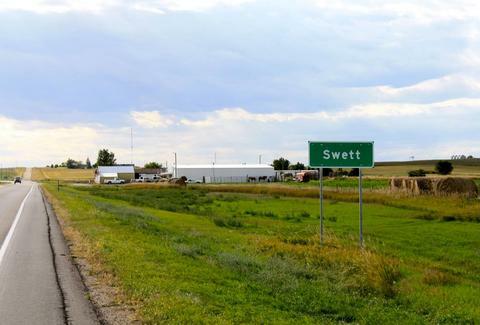 If you're not one of the two people who live there, a cowboy, or a soybean farmer just passing through, this is probably the first time you've ever heard of the town of Swett, South Dakota. But you might want to remember that name -- the entire Bennet County hamlet could be yours for just $400,000, according to the Rapid City Journal. That's right, for less than a third of the price of a Manhattan apartment, you can own an entire town. Swett consists of a house, a bar called The Swett Tavern (sounds hot! ), a few trailers, a workshop, and 6.16 sweet Swett acres of prairie land. It gives new meaning to "a one-horse town". Despite its small size, Swett seemingly proved too much for its owner/50 percent of its population, Lance Benson, a traveling concessions businessman. Benson, who lives in the lone house on the prairie with his wife next to Swett's only bar, officially put the town on the market last week in order to prioritize his business. And though it might amount to little now, Swett was once a thriving area, overrun with 40 residents, a grocery store, and a post office that was surely, like most post offices, always crowded. "I hate to get rid of it", Benson told the Rapid City Journal. Though he added that if the town doesn't sell this year, he "would probably keep it". Interested parties should consult real estate agent Stacie Montgomery. That $400,000 price tag sounds like a pretty Swett deal to us.